WE ARE NOW FINISHED FOR THE SEASON! WE EXPECT TO START SAILING IN MARCH OR APRIL. I WOULD LIKE TO THANK ALL OF OUR CUSTOMERS FOR MAKING THIS A GREAT SEASON. WE REALIZE THAT OUR BUSINESS IS ABOUT TREATING YOU LIKE OUR GUESTS, SO IF ANYONE HAS A SUGGESTION THAT WOULD HELP US SERVE YOU BETTER IN 2008 PLEASE EMAIL ME AT: info@lauraleecaptree.com WE WOULD RATHER HAVE CONSTRUCTIVE CRITICISM THAN INSINCERE PRAISE. WE HOPE YOU ALL HAVE A HAPPY AND HEALTHY NEW YEAR. 12/30/07 Sunday @ 5:30 PM: Today we caught 8 cod, keeping 6, 35 blackfish, keeping 13, 8 keeper ling, 23 pout, 60 cape shark, and 150 cunner. TOMORROW IS CANCELED DUE TO FORECAST HIGH WINDS. NEW YEARS DAY IS OUR LAST TRIP OF THE SEASON, WEATHER PERMITTING. 12/29/07 Saturday @ 5 PM: Sunday we will sail @ 7 AM and return around 4 PM. 12/28/07 Friday @ 6:30 PM: Today's trip caught 20 blackfish, keeping 12, 4 ling, 20 cape shark, and 50 pout. Saturday is canceled due to forecast high seas and wind. Sunday looks good. 12/28/07 Friday @ 9 AM: The boat sailed today. I will post a report by 8 pm today. Tomorrow, Saturday is canceled due to forecast high wind and seas. Sunday, Monday and Tuesday sound good so far. 12/27/07 Thursday @ 11 AM: Tomorrow's trip will sail as scheduled. 12/26/07 Wednesday @ 5 PM: Today's trip caught 40 blackfish, keeping 30, 2 cod, 2 ling, 10 cape shark, and 10 pout. THURSDAY IS CANCELED DUE TO FORECAST HIGH SEAS. FRIDAY LOOKS GOOD. 12/26/07 Wednesday @ 12 noon: The boat sailed today. We will decide by 6 pm tonight weather we will sail on Thursday. 12/25/07 Christmas @ 10 AM: Merry Christmas to all. We will be sailing tomorrow at 7 AM for blackfish. 12/22/07 @ 12 Noon: The boat came in early today because of rough seas. They only caught a few pout and dogfish. SUNDAY AND MONDAY ARE CANCELED DUE TO FORECAST HIGH SEAS. TUESDAY WE DO NOT SAIL ON CHRISTMAS. WE PLAN TO SAIL WEATHER PERMITTING THE DAY AFTER CHRISTMAS THRU NEW YEARS DAY. 12/21/07 Friday @ 7AM: Today's trip was canceled due to weather. Saturday sounds good and we plan to sail. 12/20/07 Thursday @ 7:30pm: Today we caught 25 blackfish, keeping 15 and 100 pout. Friday's trip is canceled due to forecast high seas. 12/19/07 Wednesday @ 4 pm: Today the boat caught 18 blackfish, keeping 10. 12/18/07 @ 4 PM: Today we sailed with 9 fishermen. The water was still brown from the storm of the last two days. One short blackfish was caught. 12/15/07 Saturday @ 3:30 pm: Today's blackfish trip caught 60 fish, keeping 34. Half of the keepers were 6 to 8 lbs. and the pool fish was 11 pounds. Sunday and Monday are canceled. Tuesday looks we will be sailing, but call the day before to be sure. 12/15/07 Saturday @ 10 AM: Today's trip has caught 12 blackfish so far, keeping 9. Sunday and Monday are canceled due to weather. We expect to sail on Tuesday, but you should always call the day before to confirm that we are sailing. 12/14/07 Friday @ 1:pm Today's blackfish trip has caught 60 blackfish so far, keeping 45, with 2 fish over 11 pounds. Tomorrow, Saturday we will sail at 7 am. 12/14/07 Friday @ 10 AM: Thursday's trip was canceled. Today the boat is out with 14 fishermen. So far they have caught 25 blackfish and kept 13, with 3 fish over 8 lbs. We plan to sail on Saturday. 12/12/07 Wednesday @ 2 pm: Today's trip caught 60 blackfish, keeping 30, with 8 fish between 8 and 16.22 lbs. The huge blackfish was 30 inches long. It was caught by Dewan Singh. Pictures coming soon. 12/11/07 Tuesday @ 7 pm; Today's blackfish trip caught 75 blackfish, keeping 43 for 19 fishermen. 12/09/07 Sunday @ 4 pm: Last night we did not catch any stripers. The water got cold and the bait left and took the stripers with them. We plan to start striper fishing 3 trips daily on April 26, 2008. Today's 7 am trip had 9 keeper blackfish and I forgot to ask how many shorts. Our next trip is Tuesday 12/11/07 from 7 am to 3 pm for blackfish. We plan to sail "fair weather only" thru 1/1/08. Please call after 6 pm the night before to confirm all sailings. 12/08/07 Saturday @ 5 PM: Today's 1 pm trip caught 25 blackfish, keeping 9 up to 8.8 lbs. BLACKFISH BIGHT BEST WHEN THE SUN IS HIGHEST IN THE SKY! THAT IS WHY WE ARE SWITCHING TO FULL DAY BLACKFISH ON TUESDAY DECEMBER 11. 12/8/07 Saturday @ 11:15 AM: Last night we caught one keeper striper. Today's 7 am trip sailed with 8 fishermen. So far they have caught 70 blackfish, keeping 54, with 4 fish over 10 lbs., largest 13lbs. 12/07/07 Friday@ 4 PM: Today at 7 am we did not sail. Today @ 1 pm we sailed with 6 fishermen. They have caught 25 blackfish so far, keeping 5 up to 5 lbs. 12/07/07 Friday @ 10 AM: Thursday at 1 pm we sailed with 9 fishermen and caught one 22 inch striper. Thursday night we sailed with 6 fishermen, cast bass assassins and drifted eels and caught nothing. The day trips will now target blackfish but if the stripers show up we will we will fish for them. YOU SHOULD CALL TO CONFIRM ALL SAILINGS! 12/06/07 Thursday @ 9 AM: Starting today at 1 PM we plan to sail all scheduled trips, but if the weather is questionable you should call to confirm sailing. 12/2/07 Sunday @ 5 PM: Today's 1 pm trip caught 30 stripers between 20 and 27 inches for 14 fishermen. 12/2/07 Sunday @ 12 Noon: Last night's trip did not sail. Just 4 fishermen showed up. Today at 7 am 22 fishermen caught 150 stripers in the snow, 5 were kept up to 20 lbs, plus 12 blues. 12/01/07 Saturday @ 5 pm: Last night it was very windy. We came in 2 hours early after catching 4 stripers. Today's 7 am trip caught 400 stripers, keeping 10. Today's 1 pm trip caught 12 stripers, keeping 4, and 80 giant blues. 11/30/07 Friday @ 7 pm: Today's 1 pm trip caught 300 stripers, keeping 13. 11/30/07 Friday @ 3 PM: Last night 12 fishermen caught 20 stripers, keeping 2. Today's 7 am trip did not sail. Today's 1 pm trip has caught 100 stripers in the first hour of jigging in the ocean, keeping 2. FROM NOW UNTIL JANUARY 1 YOU SHOULD CALL TO CONFIRM ALL SAILINGS! WE WILL NOT BE SAILING IN BAD WEATHER! 11/29/07 Thursday @ 6 PM: Today's 1 pm trip caught 28 stripers for 11 fishermen, keeping 8. 11/29/07 Thursday @ 12 Noon: Last night we caught 15 stripers for 8 fishermen, keeping 4. Today at 7 am we caught 22 stripers, keeping 11, mostly 15 to 20 lb. fish. 11/28/07 Wednesday @ 6 pm: Today's 1 pm trip caught 400 stripers, keeping 14. 11/28/07 Wednesday @ 12 Noon: Last night 9 fishermen caught 50 stripers, keeping 8. Jose Santelicrs caught 13. Today's 7 am trip caught 150 stripers, keeping 2. 11/27/07 Tuesday @ 4 PM: Today's 7 AM trip wound up catching 70 stripers, keeping 12. Today's 1 pm trip has caught 100 stripers so far, keeping 30. 11/27/07 Tuesday @ 10 am: We dad not sail last night. Today's 7 am trip is jigging stripers outside the inlet. By 10 am they had caught 35 stripers for 10 fishermen, keeping 5. 11/26/07 Monday @ 4:30 pm: Today's 1 pm trip saw 6 fishermen catch 100 stripers, everyone kept their limit. there were also about 30 blues. 11/26/07 Monday @ 11 AM: Sunday's 1 pm trip caught 50 stripers, keeping 1. Sunday night we caught 10 stripers, keeping 4. Today's 7 am trip did not sail. 11/25/07 Sunday @ 11 AM: Last night we caught 45 stripers, keeping 2. Today's 7 am trip has caught 80 stripers so far, between 20 and 27 inches. 11/24/07 Saturday @ 5 pm Today's 1 pm trip caught over 300 stripers so far, keeping 10. 11/24/07 Saturday @ 11:30 AM: Last night we caught 13 stripers, keeping 8. Today at 7 AM we have caught 400 stripers so far, keeping 6. 11/23/07 Friday @ 5 pm: Today's 1 pm trip caught 400 stripers, keeping 20 plus 30 blues. 11/23/07 Friday @ 3 pm: today's 1 pm trip has caught over 200 stripers so far. 11/23/07 @ 12 Noon: Today's 7 AM trip caught 300 stripers, keeping 10. THAT IS THREE HUNDRED STRIPERS! 11/22/07 Thanksgiving @ 10 AM: Yesterday's 1 pm trip caught 30 stripers, keeping 3. Last night we caught 30 stripers, keeping 5. WE DO NOT SAIL ON THANKSGIVING! 11/21/07 Wednesday @ 11 am: Last night's striper trip caught 24 stripers, all keepers, largest 21 lbs. Today's 7 am trip has caught 20 stripers so far, keeping 8. 11/20/07 Tuesday @ 5 pm: today's 7 am trip wound up catching 55 stripers, keeping 16. Today's 1 pm trip caught 6 stripers, keeping 5, biggest 30 lbs. 11/20/07 Tuesday @ 10 am: Monday's 1 pm trip caught 30 stripers, all under 28 inches. Monday night's trip caught 19 stripers, all keepers up to 23 lbs. Today's 7 am trip has caught 45 stripers so far, keeping 12. 11/19/07 Monday @ 2 pm: Today's 7 am trip caught 70 stripers for 7 people, keeping 10. 11/18/07 Sunday @ 12 midnight: Today's 1 pm trip caught 200 stripers, keeping 20 up to 32 lbs, for 15 fishermen. Both day trips also had at least 30 big blues. Tonight's trip caught 13 stripers, keeping 8 up to 28 lbs. 11/18/07 Sunday @ 9 AM: Last night we caught 30 stripers, keeping 5. Jose Santelices caught 9. Today's 7 am trip has caught 100 stripers already, keeping 6, for 14 people at 9 am. 11/17/07 Saturday @ 5 pm: Today's 7 am trip caught 42 stripers, keeping 12. Today's 1 pm trip caught caught 60 stripers, keeping 12. 11/17/07 Saturday @ 9 AM: Friday night we caught 40 stripers, keeping 11. The pool fish was 44 lbs, and it was 46 inches long, caught by Jim Sleckman on an eel. 11/16/07 Friday @ 5 pm: We did not sail last night or this morning. Today's 1 pm trip caught 80 stripers, keeping 19. THE NEXT FEW NIGHTS SAIL AT 6 PM. 11/15/07 Thursday @ 9 pm: Today's 1 pm trip caught over 100 stripers for 7 fishermen. Everyone had their limit. HERE IS A TIP: FOR CHUMMING DAYTIME STRIPERS THE WORSE THE WEATHER THE BETTER THE FISHING! 11/15/07 Thursday @ 1 pm: Last night's midnight trip caught 30 stripers for 9 fishermen, keeping 15. Today's 7 am trip was canceled. Today's 1 pm trip is sailing. 11/14/07 Wednesday @ 10 pm: Today's 1 pm trip caught 25 stripers, keeping 9 up to 29 lbs. Thursday's 7 am trip is canceled! 11/14/07 Wednesday @ 2 pm: last night's midnight trip caught 50 stripers, keeping 2. Today's 7 am trip caught 25 blackfish, keeping 12. Thursday's 7 am trip is canceled due to weather! The 1 pm trip will sail as scheduled for stripers weather permitting. You can call to confirm all sailings if the weather is questionable. 11/13/07 Tuesday @ 5 pm: Today's 1 pm trip caught 75 stripers, keeping 15. 11/13/07 Tuesday @ 1 pm: Last night's trip did not sail due to heavy rain. Today's 7 am trip caught 8 stripers, keeping 2 and 70 blackfish, keeping 2. 11/12/07 Monday @ 9 pm: Today's 7 am trip caught 22 stripers, keeping 8. Today's 1 pm trip kept 3 stripers up to 28 lbs. 11/12/07 Monday @ 10:30 am: Last night we caught 60 stripers, keeping 17 up to 26 lbs. Today's 7 am trip has caught 15 stripers so far, keeping 3. 11/11/07 @ 6 pm: Today at 1 pm nothing was caught. 11/11/07 @ 2 pm: Last night's striper trip caught 60 stripers, keeping 19. Today's 7 am trip caught 22 stripers, keeping 7. 11/10/07 Saturday @ 5 pm: Today's 1 pm trip caught 10 stripers, keeping 3. 11/10/07 Saturday @ 12 Noon: Last night 14 fishermen caught 30 stripers, keeping 7 up to 22 lbs. Today's 7 am trip had 12 fishermen catch 20 stripers, keeping 8. 11/9/07 Friday @ 3 pm: Thursday night we caught 45 stripers, keeping 11. Today at 7 am we caught 1 keeper striper and 3 blues. Today's 1 pm trip has caught 35 stripers so far for 9 fishermen, everyone has their limit already! 11/8/07 Thursday @ 6 pm: Today's 1 pm trip caught 33 stripers, keeping 9. 11/8/07 Thursday @ 12 Noon: Last night's trip caught 50 stripers, keeping 12, 2 bass of 25 lbs. tied for the pool. Today's 7 am trip caught 13 stripers, keeping 10. 11/7/07 Wednesday @ 7 pm: Today's 1 pm trip caught 25 stripers, keeping 8. 11/7/07 Wednesday @ 1pm: Last night we caught 85 stripers, keeping 21. Jose Santileces caught 18, Kris Katsabanis caught 16, Eric Schuller had the pool fish of 35 lbs. Today's 7 am trip caught 100 stripers for 16 fishermen, keeping 32. 11/6/07 Tuesday @ 5 pm: today's 1 pm trip saw 19 fishermen catch 100 stripers, keeping 38. Everyone had their limit! 11/6/07 Tuesday @ 12 Noon: Last night's trip caught 60 stripers, keeping 17. Today's 7 am trip caught 100 stripers for 9 fishermen, keeping their limit of 18 and throwing back 20 other keepers. 11/5/07 Monday @ 5 pm: Today's 1 pm trip caught 70 stripers, keeping 30. 11/5/07 Monday @ 12 noon: Last night's trip had 13 fishermen catch 100 stripers, keeping their limit of 26, Jose Santilices caught 30, keeping fish of 20 and 24 lbs. Chris Bell caught 14, keeping fish of 21 and 25 lbs., Chris Fargione caught 23, keeping fish of 17 and 18 lbs. Today's 7 am trip saw everyone have their limit again. 11 people caught 100 stripers, keeping 22. 11/4/07 Sunday @ 6 pm: Today's 1 pm trip caught 30 stripers, keeping 25. 11/4/07 Sunday @ 11 am: We did not sail any trips on Saturday. Today at 7 am we have caught 25 stripers so far, keeping 8. 11/3/07 Saturday @ 10 am: Friday night's trip caught 60 stripers, keeping 24. TODAY'S 1 PM TRIP IS CANCELED. TONIGHT'S 7 PM TRIP WILL SAIL AS SCHEDULED. 11/2/07 Friday @ 4:30 pm: Today's 1 pm trip has caught 30 stripers so far, keeping 14. TONIGHT'S TRIP WILL SAIL AT 6 PM. SATURDAY'S 7 AM TRIP IS CANCELED DUE TO WEATHER. WE WILL MAKE A DECISION ABOUT THE 1 PM TRIP BY 10 AM SATURDAY. SATURDAY NIGHT'S 7 PM TRIP IS SCHEDULED TO SAIL, IF WE DECIDE TO CANCEL THAT DECISION WILL BE MADE 3 HOURS BEFORE SAILING. 11/2/07 Friday @ 11:30 am: Last nights trip saw 11 fishermen catch 40 stripers, keeping 8 up to 22 lbs. Today's 7 am trip caught 35 stripers so far for 11 fishermen, keeping 17. ALL TRIPS TODAY ARE SCHEDULED TO SAIL. CHECK HERE OR CALL AFTER 6 PM TODAY TO CHECK ON TOMORROWS SAILINGS! 11/1/07 Thursday @ 5 pm: Today's 1 pm trip has caught 28 stripers so far, keeping 13. and they have 3 fish working as I write this report. 11/1/07 Thursday @ 10 am: Last night's trip caught 22 stripers, keeping 13. Today's 7 am trip so far has caught 20 stripers, keeping 13, mostly 20 lb. fish. 10/31/07 Wednesday @ 5 pm: Today's 1 pm trip caught 20 blackfish, keeping 16; 15 stripers, keeping 2; and 6 blues. 10/31/07 Wednesday @ 12 noon: Yesterday's 7 am trip caught 40 sea bass, keeping 30; and 30 big porgies. The 1 pm trip caught 15 stripers, keeping 2; 20 blues; and 25 big porgies. Tuesday night's trip caught 20 stripers, keeping 6. Today's 7 am trip caught 12 stripers, keeping 2;100 blues; 150 big porgies; and 80 sea bass, keeping 50. 10/30/07 Tuesday @ 6 am: last night's trip had 7 fishermen catch 61 stripers, keeping 14 Jose Santilices asked that this report be dedicated to his ailing wife Erica Lara. Jose caught 18 stripers, keeping fish of 16 and 18 lbs. 10/29/07 Monday @ 5 pm: Sunday night's trip caught 70 stripers, keeping 12. Today's 7 am trip saw 12 fishermen catch 100 sea bass, keeping 70; 50 porgies; and 1 keeper striper. Today's 1 pm trip caught 200 blues, kept 100 porgies; and 70 sea bass, keeping 50. 10/28/07 Sunday @ 5:30 pm: Today's 1 pm trip caught 5 stripers, keeping 2 up to 26 lbs. ; 10 blues; 70 sea bass, keeping 50. 10/28/07 Sunday @ 3:30 pm: Last night's midnight trip caught 11 stripers, keeping 8 up to 22 lbs, plus 5 big blues. Today's 7 am trip caught 20 stripers, keeping 19, plus 20 big blues. 10/27/07 Saturday @ 5 pm: Friday night we caught 21 stripers, keeping 16. Today at 7 am 7 fishermen drifted live shad for stripers of 21 and 24 lbs. Today at 1 pm 11 fishermen caught 37 stripers, keeping 17. 10/26/07 Friday @ 4 pm: Today's 7 am trip caught 40 blackfish, keeping 15. So far on the 1 pm trip 9 fishermen have caught 15 stripers, keeping 9. 10/26/07 Friday @ 5 am: Thursday's 1 pm trip didn't sail. Thursday night's trip caught 34 stripers on eels, keeping 29. 10 fish were over 20 lbs. 10/25/07 Thursday @ 1 pm: Last night's striper trip caught 6 stripers, keeping 1. Today's 7 am trip caught 35 stripers, keeping 2, plus 35 blackfish, keeping 20. 10/24/07 Wednesday @ 3 pm: Last night's striper trip saw 10 fishermen catch 21 stripers, keeping 6. Today at 7 am 17 fishermen caught 75 stripers, keeping 29 plus 12 keeper blackfish. and on today's 1 pm trip, so far they have had 11 fishermen catch 20 stripers, keeping 7. 10/23/07 Tuesday @ 6 pm: Today's 1 pm trip caught 30 stripers, keeping 5. 10/23/07 Tuesday @ 12 noon: Last night we caught 7 stripers on eels, keeping 6 to 24 lbs. Today's 7 am trip saw 9 fishermen catch OVER 100 STRIPERS. EVERYONE CAUGHT THEIR LIMIT. They threw over 20 keepers back. 10/22/07 Monday @ 5:30 pm: Today's 1 pm trip caught 22 stripers, keeping 7, 5 blues, and 20 sea bass, keeping 10. 10/22/07 Monday @ 10:30 am: Sunday afternoon we caught 4 stripers. Sunday night we caught 15 stripers, keeping 1. Today's 7 am trip has caught 10 stripers so far, keeping 3. 10/21/07 Sunday @ 10:30 am: Saturday night we caught 19 stripers on eels, keeping 14 up to 27 lbs. Today's 7 am trip has caught 45 stripers so far, keeping 12. 10/20/07 Saturday @ 4 pm: On today's 1 pm trip they have caught 17 stripers, keeping 7 so far. 10/20/07 Saturday @ 1 pm: Today's 7 am trip saw 9 fishermen catch 37 stripers, keeping 12. 10/19/07 Friday @ 5 pm: Tonight's 6 pm striper trip is canceled due to weather. All other trips will sail as scheduled. 10/19/07 Friday @ 1:30 pm: Thursday night we caught 8 stripers on eels, keeping 6 to 26 lbs, plus a 12 lb. bluefish. Today's 7 am trip had 8 fishermen catch 16 stripers, keeping 4, plus 20 blackfish, keeping 8. Today's 1 pm trip didn't sail. 10/18/07 Thursday @ 4 pm: Wednesday's 7 am trip caught 200 mixed sea bass and porgies, keeping 60, and 200 small blues. Wednesday's 1 pm trip caught 60 blackfish, keeping 8. Wednesday night we caught 8 stripers, keeping 5. Today at 7 am 8 fishermen caught 40 stripers, keeping 8. Today at 1 pm so far they have caught 50 blackfish, keeping 25, and 5 stripers. 10/16/07 Tuesday @ Midnight: Monday night 11 fishermen caught 4 stripers, 2 weakfish, and 50 shad. Today's 7 am trip caught 200 sea bass and porgies, keeping 100 plus 50 small blues. Today's 1 pm trip caught 300, keeping 150, plus 50 blackfish, keeping 12. Tonight's trip caught 5 stripers between 23 and 26 inches and over 100 weakfish from 2 to 5 lbs. 10/15/07 Monday @ 4:30 pm: Last night's trip caught 40 stripers, keeping 7, plus 7 weakfish. Mike Collins caught 4, keeping fish of 25 and 15 lbs. Jose Santelices caught 6 to 10 lbs. Today's 7 am trip caught 200 mixed sea bass, porgies, blacks and weakfish, keeping 75. Today's 1 pm trip caught 50 blackfish, keeping 14 and 7 keeper stripers and 3 shorts so far. 10/14/07 Sunday @ 6 pm: Today's 1 pm trip had 20 fishermen catch 150 mixed sea bass and porgies, keeping 60. 10/14/07 Sunday @ 2 pm: Saturday's midnight trip caught 65 stripers, Mostly between 22 band 26 inches, 12 weakfish, and a few blues. Francisco Aleman caught the 29 lb. pool fish, Jose Sanillices was high hook with 14 stripers. Today's 7 am trip had 400 mixed sea bass and porgies, keeping 1 in 4. 10/13/07 Saturday @ 6 pm: This cooler weather has stimulated all of our fishing. Friday night 12 fishermen caught 42 stripers, keeping 7, Tom Mazur caught 4, keeping fish of 33 and 23 lbs. Jose Santelices caught 9 to 28 lbs. Today's 7 am trip caught 200 sea bass and porgies, keeping half. Today's 1 pm trip caught 350 sea bass keeping half. 10/12/07 Friday @ 8 pm: We did not sail yesterday or this morning. Today's 1 pm trip saw 9 fishermen catch 30 stripers, keeping 7. 10/11/07 Thursday @ 2 pm: Wednesday night 13 fishermen caught 24 stripers, keeping 9, plus 2 big blues. Jay Rosen caught 3 up to 17 lbs. Tony Gallo caught 5, keeping 2, and Brian Dunston caught 5. 10/10/07 Wednesday @ 2 pm: Tuesday's 1 pm trip chummed for stripers with 8 fishermen. They caught 3 and 1 blue. Tuesday night we didn't sail. Today at 7 am 9 fishermen caught 120 blackfish, keeping 30, with 10 over 5 lbs. John Garone caught 34, keeping 6. Today's 1 pm trip didn't sail. THIS WEATHER SHOULD STIMULATE THE STRIPERS! 10/9/07 Tuesday @ 1:30 pm: Last night 11 fishermen caught 10 stripers, most between 22 and 26 inches, but the pool fish weighed 35 lbs. It was caught by Russell Busch on an eel. Today's 7 am trip saw 12 fishermen catch 60 blackfish, keeping 4, largest 7 lbs. 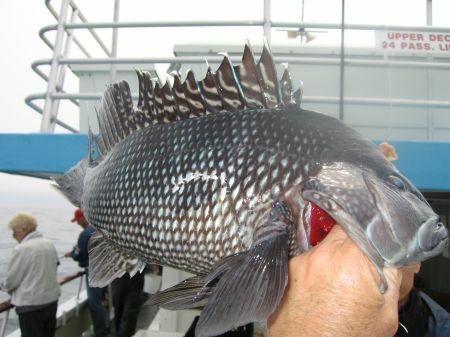 10/8/07 Monday @ 4:30 pm: Today's 1 pm trip has caught 100 mixed sea bass and blackfish, keeping just a few, so far. 10/8/07 Monday @ 2 PM: Sunday's 1 pm trip caught 70 sea bass, keeping 1 in 5. Sunday nights trip caught 3 stripers, largest 25 inches, 2 weakfish, 4 blues, 3 shad. Today's 7 am trip caught 100 blackfish, keeping 12, and 100 small sea bass. 10/7/07 Sunday @10 am: Saturday's 1 pm: trip caught 50 sea bass, keeping 1 in 3. Saturday night's trip caught 10 stripers, keeping 4 up to 24 lbs, 5 blues, and 3 weakfish. Today's 7 am trip has caught 10 blackfish, 30 sea bass and a few porgies so far. 10/6/07 Saturday @ 2 pm: Friday's 1 pm trip caught 50 sea bass, keeping 25, 30 blackfish, keeping 15, and 10 porgies. Friday night's trip caught 9 blues and 2 stripers, largest 27 inches. Today's 7 am trip caught 150 sea bass, keeping 1 in 5, 20 small porgies, and 7 small blackfish. 10/5/07 Friday @ 11 am: Thursday night we caught 6 stripers, largest 32 inches, 2 weakfish, and 3 blues. Today's 7 am trip caught 70 blackfish, keeping 20 so far. 10/4/07 Thursday @ 1 pm: Wednesday's night trip caught 2 stripers, 16 and19 lbs. and 3 big blues. Today's 7 am trip caught 100 blackfish for 11 fishermen, keeping 20. 10/3/07 Wednesday @ 4 pm: Tuesday's night had 10 fishermen catch 2 stripers, largest 24 lbs, and 2 big blues. The weakfish that we have been slaughtering on the change of tide didn't show. Today's 7 am trip caught 60 blackfish, keeping 20. Today's 1 pm trip so far has caught 70 blackfish, keeping 25. 10/2/07 Tuesday @ 2 pm: Monday at 1 pm 16 fishermen caught over 100 blackfish, keeping 43. Monday night no stripers on eels, but we anchored west of the bridge and caught Over 100, 2 to 5 lb weakfish, plus some blues. Paul Curto caught 15, Ed Wissman lost count after 17. Half of the fishermen on board caught their limit. Today's 7 am trip 16 fishermen caught 140 blackfish, keeping 26. Today's 1 pm trip has caught 30 blackfish already. 10/1/07 Super fishing last night. Just 1 striper caught, but over 100 weakfish between 3 and 5 lbs. caught, plus some big blues. Almost every one had their limit. Chris Bell, Jason Steed and Mike Tepes all caught at least twice their limit. Today's 7 am trip caught over 100 blackfish, keeping 64. Mike Osterman caught his limit of 10 keepers. 9/30/07 Sunday @ 5 pm: Today's 1 pm trip caught 100 porgies and 50 sea bass, keeping half. Blackfish season opens tomorrow. 9/30/07 Sunday @ 1pm: Last night's trip caught 22 stripers, mostly between 22 and 26 inches, 20 weakfish between 2 and 5 lbs. 4 blues to 10 lbs., 15 shad and 5 fluke. Today's 7 am trip caught 150 fish, mostly porgies, keeping 100. Blackfish season opens tomorrow! 9/29/07 Saturday @ 4:30 pm: Today's 1 pm trip caught 150 mixed sea bass and porgies for 20 fishermen, keeping 50. 9/29/07 Saturday @ 2 pm: Last night's trip saw 16 fishermen catch 10 stripers up to 31 inches, 15 blues, 7 weakfish, and 2 fluke. Today's 7 am trip caught 400 mixed sea bass and porgies, keeping 80. 9/28/07 Friday @ 4 pm Last night we sailed with 5 fishermen. we caught 9 stripers between 22 and 27 inches, 5 weakfish, 1 big blue, 2 fluke and 12 shad. Today's 7 am trip didn't sail [just 1 person]. Today @ 1 pm 8 fishermen have caught 9 stripers so far, keeping 1. This northwest wind should help all of our fishing! 9/27/07 Thursday @ 5 pm: Last night's trip caught 2 short stripers, 2 blues and a weakfish. Today's 7 am trip caught 300 mostly porgies, keeping 1 in 8. today at 1 pm we took 12 fishermen for stripers, catching 13, keeping 1 plus a bluefish. Constant southwest wind kills the fall fishing. Look for a change in wind direction to move fish. Blackfish season opens Monday! 9/26/07 Wednesday @ 5 pm: today's 1 pm trip caught 200 mixed sea bass and porgies, keeping 1 in 4. 9/26/07 Wednesday @ 3 pm: Last night's trip caught 7 short stripers on bass assassins and 3 on eels, keeping one 20lb bass. Today's 7 am trip caught 150 fish, keeping 50, mostly porgies. 9/25/07 Tuesday @ 4:30 pm: Last night's trip caught 3 stripers, 3 weakfish, 10 blues, 5 fluke, 25 shad. Today's sea bass trips caught about 200 fish each, mostly porgies, keeping 1 in 3. 9/24/07 Monday @ 4 pm: Today's 1 pm trip ran into acres of 2 to 5 lb blues on the way to the reef. 22 fishermen all limited out, a total slaughter! 9/24/07 Monday @ 12 noon: Last night's trip caught 10 stripers, keeping 1, 70 weakfish, 100 small blues, and 100 shad. Today's 7 am trip had just 8 fishermen, they caught 100 porgies, 30 small blues, 30 sea bass, keeping 50 fish total. 9/23/07 Sunday @ 6 pm: Today's 1 pm trip caught 300 mixed sea bass and porgies, keeping 1 in 5. 9/23/03 Sunday @ 12 noon: Yesterday's sea bass trips caught caught 250 to 300 sea bass per trip, keeping 1 in 5. Today's 7 am trip caught 350 sea bass, keeping 1 in 5 plus 60 big porgies. Last night's trip caught 2 stripers, 1 big blue, 10 very small blues, 45 weakfish, 3 fluke, and 100 shad. 9/22/07 Saturday @ 11:30 am: Friday's 1 pm trip had 15 fishermen catch 200 sea bass, keeping 100. Friday's night trip caught 5 keeper stripers, 70 weakfish and 50 shad. Filipe Orellana Had stripers of 15 and 17 lbs. plus 5 weakfish. 9/21/07 Friday @ 12 noon: Last night we caught 2 short stripers, 3 blues, 50 weakfish, and 10 shad. Today's 7 am trip caught 250 mixed sea bass and porgies, keeping 75. 9/20/05 Thursday @ 5 Pm: Today's 1 pm trip had 15 fishermen catch 200 sea bass, keeping 100. 9/20/07 Thursday @ 11:30 am: Last night's trip caught 3 stripers, keeping 2, 6 blues, 70 weakfish, 30 shad. Today's 7 am trip saw 400 mixed sea bass and porgies with 60 kept. 9/19/07 Wednesday @ 5 pm: Today's 7 am trip caught 300 mixed sea bass and porgies, keeping 100. Today's 1 pm trip caught 500 sea bass and porgies, keeping 100. 9/19/07 Wednesday @ 11 am: Last night's striper trip caught 25 stripers, keeping 14, plus 9 big blues. Ed Friswald caught 4 stripers, keeping fish of 14 and 18 lbs. Diane Johnson kept stripers of 14 and 16 lbs. Eddie Kumshet Caught 3 stripers including the 22 lb. pool fish. 9/18/07 Tuesday @ 4:30 Pm: Last night's striper trip saw 27 stripers caught, 10 kept, plus 8 giant blues. Sal Ganbina caught 4 stripers, keeping fish of 13 and 15 lbs. Rich Wagner Caught 4 Keeping a 20 lber. Frank Gnolfo caught 3, keeping a fish of 18 lbs. Today's 7 am trip caught 10 stripers, keeping 3, plus 3 big blues, and 75 sea bass, keeping 1 in 5. Today's 1 pm trip caught 150 sea bass and porgies, keeping 1 in 3. 9/17/07 Monday @ 4:30 pm On today's 1 pm trip Capt. Ken had 200 sea bass and porgies, keeping 1 in 3. 9/17/07 Monday @ 11 am: Last night's striper trip caught 30 stripers, keeping 12. Mark Klug had the pool 20 lb. bass. Bonnie Jones had keepers of 10 and 18 lbs. and Mike Hofer Kept fish of 10 and 15 lbs. Today at 7 am Capt ken caught 300 sea bass and porgies, keeping 1 in 5. 9/16/07 Sunday @ 3 pm: Last night was our last midnight striper trip for a while. Tonight we sail at 6 pm. We caught 25 stripers, keeping 10, Tom Mazur caught the pool fish of 25 lbs. Dave Anderson and Tim Grimes both had their limit. Sea bass trips continue to catch about 500 fish a trip, keeping 1 in 5. 9/15/07 Saturday @ 5 pm: Last night's Midnight striper trip landed 55 stripers, keeping 30, 8 big blues, and 1 weakfish. Felipe Orellana Was hi hook catching 6 and keeping bass of 15 and 18 lbs. Dan Murphy kept fish of 10 and 15 lbs., Rob Devlin Kept fish of 10 and 20 lbs. and J. P. Godek Caught the pool fish of 34 lbs. Today's sea bass trips. caught 400 to 500 fish on each trip, keeping 1 in 5. 9/14/07 Friday @ 4 pm: Last night's Midnight striper trip 19 fishermen caught 31 stripers, keeping 17 up to 31 lbs., plus 6 big blues. Jay Hubley caught 4 bass, keeping fish of 21 and 26 lbs. Jay Rosenblum caught 2 big blues, and 4 stripers, keeping fish of 14 and 16 lbs. David Deepak had the 31 lb. pool fish. Today's sea bass trips caught 400 fish per trip, keeping 1 in 4. 9/13/07 Thursday @ 4 pm: Super sea bass fishing today, 600 sea bass on the 7 am trip and 1000 on the 1 pm. Fishermen are keeping 1 out of 5, and hi hook has been over 40 fish. 9/13/07 @ 11 am: Fishermen on last night's midnight striper trip caught 23 stripers, keeping 13. Brittany Buchanan caught 3, keeping fish of 18 and 22 lbs. Larry Berenson kept fish of 14 and 15 lbs. and Tom Mazur Caught 4 stripers, keeping fish of 15 and 18 lbs. 9/12/07 @ 5 pm: Today's 1 pm trip had 15 fishermen catch 200 sea bass, keeping 100. 9/12/07 @ 2 pm: Last night's 11 pm trip sailed with 5 fishermen. We caught 16 stripers, keeping 10, plus 5 giant blues. Dave Slobodkin caught 4, keeping bass of 22 and 14 lbs. Jay Rosenblum caught 6 stripers, keeping fish of 12 and 20 lbs., plus 2 big blues. Today at 7 am Capt. Ken caught 150 sea bass, keeping 1 in 3 and 100 porgies, keeping half, plus a couple of stripers, for 13 fishermen. 9/11/07 @ 6 pm: Last night at 11 pm we caught 17 stripers, keeping 11, plus 5 big blues. Today we sailed at 1 pm with 4 fishermen in windy conditions. We fished the inlet for stripers, keeping 4 and a big blue. 9/10/07 @ 3 pm: Super striper fishing last night on the 11 pm prime time trip! 13 fishermen caught 38 stripers on eels, keeping 24. John Tanembaum caught 6, keeping fish of 14 and 18 lbs. Tom Moriarity caught 4, keeping fish of 21 and 18 lbs. 9/9/07 Sunday @ 5 pm: Today at 1 pm Capt. Rich had 29 fishermen. They caught 300 sea bass, keeping 75, and 200 porgies, keeping 100. 9/9/07 Sunday @ 2 pm: Last night at 6 pm they caught 2 weakfish and 10 stripers, keeping 6 up to 25 lbs. The 11 pm trip caught 15 stripers, keeping 8 up to 18 lbs. Today at 7 am 34 fishermen caught 500 sea bass, keeping 75, plus 40 big porgies. 9/8/07 Saturday @ 1 pm: Big stripers last night. The 6 pm trip caught 27, keeping 17 up to 25 lbs. The 11 pm trip 26 fisherman caught 26 stripers, keeping 21, with 3 fish between 26 and 34 lbs. The later trips will have the best tide now. We sail at 11 pm the next few nights, click on calendar for fall striper schedule. This morning Captain Rich caught 300 sea bass with 1 in 4 kept. 9/7/07 Friday @ 7 pm Super sea bass continues! 300sea bass this morning for 19 fishermen. 95 year old Ziggy caught 25, keeping 3 sea bass,2 trigger fish, and a couple of porgies. This afternoon hi hook caught 50 sea bass and porgies. 9/6/07 Thursday @ 10 pm: Today's sea bass trips each caught about 500, keeping 60 to 70. Super stripers again tonight. 50 stripers caught, 27 kept up to 30 lbs. 9/5/07 Wednesday @ 10 pm: Super stripers tonight! 20 fishermen caught over 40 big stripers as of 9:30 there were 29 keepers. 9/5/07 Wednesday @ 3 pm: Last night at 6 pm 17 fishermen caught 20 stripers, keeping 15 up to 33 lbs. Edwin Friswold Had fish of 25 and 33 lbs. Dean Claiborn 18 and 16 lbs. , Rich Goetchius 22 and 20 lbs. David Johnson 22 and 18 lbs. Luke Johnson 23 and 20 lbs. The sea bass trips catch about 500 sea bass with 1 in 5 a keeper. Today at 7 am 96 year young Ziggy caught 33 sea bass, keeping 7. 9/4/07 Tuesday @ 10 am: Last night's 6 pm trip sailed with 14 fishermen. They caught 12 stripers. Lisa Browne kept fish of 17 and 18 lbs. Jimmy O'Neal kept 2 weighing 16 and 18 lbs. Today's 7 am trip has caught 400 sea bass already. 9/3/07 Monday @ 4 pm: Yesterday's 6 pm trip fished the ocean reef. They caught about 100 sea bass and porgies. Last night's 11 pm trip caught 137 weakfish, a few blues and 50 shad. Today's 7 am trip caught 600 sea bass, keeping 100, plus 50 porgies. Today at 1 pm They caught 400 sea bass, keeping 150. 9/2/07 Sunday @ 7 pm: Yesterday's 1 pm trip caught 40 fluke keeping 4 to 6+ lbs. The 6 pm trip caught 70 porgies, 10 sea bass and 20 blues. The 11 pm trip caught 10 blues, 15 porgies, and 60 sea bass. Today's 7 am trip caught 200 fluke, keeping 17 to 5 lbs. The 1 pm trip caught 20 fluke, no keepers, and 30 sea bass. Tomorrow we start sea bass and porgies everyday, and we will try eel fishing for stripers on the 6 pm trip. 9/1/07 Saturday @ 11 am: Yesterday's 1 pm trip caught 900 sea bass, keeping 100. Last nights 6 pm trip had slow fishing. The 11 pm trip caught 7 stripers to 29 inches, 5 weakfish and 6 blues. Today's 7 am trip caught 120 fluke, 18 were between 19.5 and 26 inches. 8/31/07 Friday @ 3 pm: Last night's 6 pm trip had slow fishing. Just a couple of weakfish and blues. Today's 7 am trip caught 800 sea bass, keeping 100, plus 80 porgies. 8/30/07 @ 7:20 pm SPECIAL NOTICE: schedule change. Beginning Monday September 3, 2007 We will be fishing for sea bass everyday at 7 am and 1 pm. 8/30/07 Thursday @ 7 pm: Last night's 6 pm trip caught 50 blues and 2 stripers. Today's 7 am trip caught 120 fluke, 25 were between 19.5 inches and 6 lbs. Today @ 1 pm Capt. Ken caught 100 fluke, keeping 15 between 19.5 inches and 5.7 lbs. 8/29/07 Wednesday @ 6 pm: Last night at 6 pm they caught 12 blues and a 15 lb. striper. Today we caught 1600 sea bass. We kept 200 in the morning and 160 on the 1 pm trip. We also had trigger fish and 400 porgies. 8/28/07 Tuesday @ 10:30 pm: Last night's 6 pm trip had 7 blues to 10 lbs. and 2 stripers. Tonight's 6 pm trip had 12 blues to 12 lbs and a 15 lb striper. Today's fluke trips saw 25 in the morning and 50 in the afternoon. The 1 pm trip pool fish was over 5 lbs. The morning trip also saw some sea bass. Sea bass tomorrow. 8/27/07 Monday @ 7 pm: Yesterday afternoon's fluke trip fished in the ocean catching 25 fluke, mostly between 16 and 19 inches. Last night's trip caught a half dozen big blues in the inlet. Today' sea bass trips were good on the reef. The morning trip caught 500 fish, keeping 140, mostly porgies. The 1 pm trip caught 700 fish, keeping 180, mostly sea bass. Both trips also had big stripers and triggerfish. 8/26/07 Sunday @ 2:30 pm: Big stripers on last night's 11 pm trip. 17 stripers caught, 14 keepers to 39 lbs. Danny Abbati caught 3, keeping fish of 19 and 26 lbs. Jimmy Smith kept fish of 16 and 17 lbs. Matt Marulli had the 39 lb pool fish. Today's 7 am trip caught 150 fluke, and 15 big sea bass. 8/25/07 Saturday @ 10 pm: Today's 1 pm trip fished in the bay and caught 30 fluke most between 15 and 19 inches. Tonight's 6 pm trip fished the inlet and caught 20 stripers, 3 between 28 and 34 inches, and a few big blues. 8/25/07 Saturday @ 3 pm: Last night's 11 pm trip had 13 fishermen catch 4 keeper stripers from 30 to 37 inches, and a couple of big blues. Today's 7 am trip fished in the bay and caught 100 fluke, mostly between 15 and19 inches. 8/24/07 Friday @ 9 pm: Today's 1 pm trip had good fishing for sea bass and porgies on the reef. 600 fish were caught, 100 kept, plus 10 trigger fish and a keeper striper. Tonight's 6 pm trip has been slow so far. We will be fishing for stripers, weaks, and blues on the 6 pm trips until further notice. 8/24/07 Friday @ 3 pm: On today's 7 am sea bass trip we caught 500 sea bass, keeping 60, plus 40 big porgies, a few blues, trigger fish, and a 20 lb. striper. 8/23/07 Thursday @ 10 pm: On tonight's 6 pm trip Capt. Ken started fishing for sea bass and porgies. With 18 fishermen they caught a lot of small sea bass , but just a few porgies. When the tide started to ebb He switched to striper fishing. They caught 11, 8 were between 28 and 38 inches. they also had 7 big blues. 8/23/07 Thursday @ 4 pm: On the 7 am trip there was a 6 foot roll in the ocean today. Very few fluke bit. The sea bass did bite, catching 75 in the last half hour. The 1pm trip fluke fished in the bay. They have caught 50 so far, between 14 and 19 inches. 8/22/07 Wednesday @ 9:30 pm: Good fishing on tonight's 6 pm trip. Porgy fishing was slow, so Capt Ken switched to stripers at 8 pm. 13 fishermen caught 13 stripers. 10 were keepers, with the largest 44 inches. 4 keeper stripers Monday night, 6 keepers last night, 10 keepers tonight. I like the trend. 8/22/07 Wednesday @ 8 pm: Too rough for the ocean today. The 1 pm trip fished in the bay. They caught some porgies and a lot of small sea bass and snapper blues. 8/22/07 Wednesday @ 1 pm: Sailed 7 am with 13 fishermen. Too rough for the ocean. We fished in the bay and caught 7 fluke, 4 stripers to 33 inches, and a few bluefish. 8/21/07 Tuesday @ 11 pm: Sailed today at 7 am. Fished in the bay, due to high seas. Not many fluke caught, none over 19.5 inches. Tonight at 6 pm sailed with 8 fishermen. Ten year old Dario Paolucci caught a 5 lb. blue and three stripers, keeping fish of 30 and 39 inches. Scott Pietroricca caught 3 stripers, keeping a 30 inch fish. Tomorrow's 6 pm trip will probably fish for porgies till dark, and then for stripers. 8/20/07 Monday @ 10 pm: Today at 1 pm we fished in the bay and caught 35 porgies, 8 trigger fish and a few stripers. Tonight's 6 pm trip had just ten fishermen. They caught 4 keeper stripers from 29 to 38 inches, and 5 giant blues. 8/20/07 Monday @ 11 am: Last night's 6 pm trip had just 13 people. We anchored on a wreck and chummed. We caught 75 sea bass, 10 porgies and a few fluke. Today at 7 am we did not sail Today's 1 pm trip will fish in the bay for prime time porgies. 8/19/07 Sunday @ 5 pm: Today at 1 pm 150 fluke to 5 lbs. 75 over 18 inches, 15 over 19.5 inches. Slow drift, a little more breeze and they would have caught twice as many. Sea bass tomorrow! 8/19/07 Sunday @ 2 pm: Last night's 6 pm trip fished around the reef. No blues, but 100 fluke to 8 lbs. and some sea bass.. The 11 pm trip started in the ocean and finished at the bridge. Just a few big blues caught. Today at 7 am, There was no wind and no drift in the ocean. They still caught 120 fluke, with half over 18 inches, and 8 between 19.5 inches and 24 inches. 8/18/07 Saturday @ 3:45: Super fluke fishing on both trips. On the 1 pm trip Capt. Ken caught 150 fluke on the first drift, They have 2 fluke over 6 lbs. so far. Fluke tomorrow! 8/18/07 Saturday @ 10:30 am: Last night on the 6 pm trip they had 10 blues. The 11 pm trip had 20 blues, 1 weakfish and a few stripers. The forecast is for 2 foot seas so we may fish for ocean blues on the 11 pm trip tonight. Today's 7 am trip has caught over 200 fluke so far, 100 are over 18 inches, 12 are between 19.5 and 24 inches! 8/17/07 Friday @ 7 pm: Today's 7 am trip caught 250 sea bass and porgies for 24 fishermen, keeping 100. We also caught 10 fluke on the clams, keeping 4, to 5 lbs. The 1 pm trip caught 500 fish, keeping 200. Fluke tomorrow! 8/16/07 Thursday @ 8 pm: On today's 1 pm trip Capt. Ken Had 200 fluke, 24 between 19.5 and 25 inches, and 3 over 5 lbs. Capt. Rich on the 6 pm trip has a half dozen blues so far. 8/16/07 Thursday @ 2 pm: Today at 7 am we caught 130 fluke, 23 were between 19.5 and 24 inches. the pool fish weighed 5.05 lbs. 8/15/07 Wednesday @ 10 pm: Very slow fishing on tonight's 6 pm trip. the pool fish was a 3 lb. weakfish. 8/15/07 Wednesday @ 5:pm: Slow fishing on today's 7 am trip. 200 fish caught, 50 kept, half sea bass, half porgies. Today's 1 pm trip was changed to fluke in the bay, due to rough seas. 100 fluke caught. Just a handful of fluke between 19.5 and 22 inches, most fish 15 to 18 inches. Ocean fluke tomorrow morning! 8/14/07 @ 10 pm: Today's 1 pm trip caught 60 fluke, Mostly between 18 and 19.5 inches . 8 were between 19.5 and 26 inches. Tonight at 6 pm Capt. Rich Had 20 big blues in the inlet and 1 striper. 8/14/07 @ 12 noon: Capt. Ken had super fluke fishing for big fish on today's 7 am trip. They had over 100 fluke, 40 were between 19.5 and 28 inches, 10 were over 6 lbs, and 5 were over 7 lbs. Bill Fynott caught 8, keeping his limit of 4, of which 2 were over 5 lbs. 8/13/07 Monday @ 11 pm: Capt. Ken had loads of big blues all around the boat on the 6 pm trip, plus a few stripers, for just 14 fishermen. Big ocean fluke tomorrow! 8/13/07 Monday @ 5 pm: last night's 6 pm trip caught 15 big bluefish in the inlet. Today @ 7 am we caught 250 sea bass and porgies, keeping 75. The 1 pm trip caught 250 sea bass and porgies, keeping 120. Both trips also saw a few big fluke. Fluke tomorrow. 8/12/07 Sunday @ 4:30 pm: Yesterday's 6 pm trip caught 250 sea bass and porgies, keeping 90. The 11 pm trip had 15 bluefish. Today's 7 am trip had super fishing for big fluke. They caught 250 fluke, 175 were over 18.5 inches, 38 were between 19.5 and 26 inches, 10 were between 6 and 7.5 lbs. Todd Mauro caught 9 including the 7.5 lb pool. On today's 1 pm trip 7 year old Jessie Romao Caught his limit of 4 keepers between 19.5 and 23 inches. Sea bass tomorrow! 8/11/07 Saturday @ 5pm: Today's 1 pm trip fished the ocean reef. There was a 3 to 5 ft left over roll, which always puts the fluke off their bite. They caught 80 sea bass, 20 porgies and 40 fluke at the end of the trip, when they just started to bite. Both of tonight's trips are likely to fish in the ocean. 8/11/07 Saturday @ 12 noon: The only trip to sail in yesterday's bad weather was 11 pm . 12 fishermen caught 8 blues, 1 striper, and 1 weakfish. Today there is a leftover roll in the ocean, which is diminishing. This morning Capt. Ken fished in the bay, catching 70 fluke, with 1 in 10 between 19.5 and 23 inches. 8/10/07 Friday @ 11:45 am: today's 1 pm trip is canceled. All other trips are scheduled to sail. 8/10/07 Friday @ 8 am: We didn't sail this morning [rain and no people]. Capt. Ken may change today's 1 pm trip to fluke in the bay. Today's 6pm and 11pm trips should be good. 8/9/07 Thursday @ 9:30 pm: Tonight's 6 pm prime time trip in the bay kept 250 porgies, a few weakfish, and threw back a couple of short stripers. Sea bass tomorrow [weather permitting]. 8/9/07 Thursday @ 4:30 pm: Today's 7 am trip caught 300 fluke, with 32 between 19.5 and 27 inches, and 2 over 7 lbs. Today at 1 pm Capt Ken has caught 250 fluke, mostly fish from 16 to 19 inches. Prime time porgies tonight! Sea bass tomorrow! 8/8/07 Wednesday @ 11 pm: Today's 7 am trip was canceled due to severe weather. We changed the 1 pm trip to bay fluke due to rough seas. We caught 200 fluke, with 6 between 19.5 inches and 22 inches. Tonight's prime time porgy trip caught 200. Eddie Canuhi was hi hook keeping 18. Ocean fluke tomorrow! 8/8/07 Wednesday @ 6 am: On last night's 6 pm trip we had 20 blues, a few weakfish and a striper. Sea bass today! Prime time porgies tonight! 8/7/07 Tuesday @ 5 pm: Today's 1 pm trip caught 125 fluke in the ocean. 1 in 7 was between 19.5 and 24 inches. A little more breeze would have been better. 8/7/07 Tuesday @ 1 pm: Last night at 6 pm, after two nights of great weakfishing in the inlet they never showed. I guess the tide was just too late. Today at 7 am there was no drift in the ocean, but Capt. Ken still managed over 100 fluke, with 20 between 19.5 and 24 inches. 8/6/07 Monday @ 6 pm: Super fishing on both trips today, fishing the ocean in the morning and the bay in the afternoon. Many people had their limit of big porgies, and the 7 am trip had big sea bass too. 8/6/07 Monday @ 9:30 am: On today's 7 am sea bass trip with just 12 people they have kept 100 fish already, plus 22 and 30 lb. stripers. Today at 1 pm we plan to fish the bay for prime time porgies, sea bass, and triggers. 8/6/07 Monday @ 1 am: Today's 1 pm trip caught 150 fluke for 28 fishermen, mostly 16 to 19 inch fish. Tonight's 6 pm trip kept 76 weakfish, 12 blues, and threw back 10 stripers. Robbie Ames Caught 8 weakfish, 3 blues, and a 27 inch striper. 8/5/07 Sunday @ 2 pm: Last night's 6 pm trip wound up keeping 48 weakfish. The 11 pm trip chummed in the ocean and caught 130 blues, mostly 6 to 10 lbs. Mark Gary was hi hook with 13 blues to 15 lbs. Today's 7 am trip caught 300 fluke, 100 were over 18 inches and 22 were between 19.5 and 25 inches. 8/4/07 Saturday @ 10 pm: Capt. Ken says they caught 300 fluke on the 1 pm trip. The 6 pm trip has 40 weakfish and 15 blues. 8/4/07 Saturday @ 2:30 pm: Last night at 6 pm they had 30 blues and 5 weakfish. The 11 pm trip didn't sail [ severe thunder storm warning]. Today at 7 am we caught 150 fluke, 25 were between 19.5 and 26 inches. the pool was 6.8 lbs. Capt. Ken Has caught 35 fluke on his first drift on the 1 pm trip. 8/3/07 Friday @ 5 pm: Today's 1 pm trip wound up catching 500 fish and keeping 100 porgies and 150 sea bass. 8/3/07 Friday @ 3 pm: Today's 7 am trip caught 700 sea bass and porgies, keeping 100, plus some big stripers and fluke. The 1 pm trip has 100 porgies in the boat and they are just anchoring on a sea bass drop. 8/2/07 Thursday @ 9 pm: Super fishing on tonight's 6 pm trip. 12 fishermen have caught 30 weakfish and 40 blues so far. 8/2/07 Thursday @ 5 pm: Today's 7 am trip: 60 big fluke caught, 27 over 19.5 inches, 10 between 4 and 8 lbs. Erik Reinfeld caught 15, keeping 4 to 7.53 lbs. The total weight of his 4 keepers was 19.9 lbs. On the 1 pm trip Capt. Ken reports that they caught 200 fluke for just 24 fishermen, with 2 fish around 8 lbs. 8/1/07 Wednesday @ 9 pm: Today on the 1 pm trip they caught 600 sea bass, keeping 100 plus 50 porgies. Tonight's 6 pm trip has 100 blues so far. 8/1/07 Wednesday @ 2:50 pm: Today's 7 am trip caught 700 sea bass, keeping 200, plus 40 porgies. Heinz Schimmrich had 3 triple headers, catching 22, keeping 7, George Kiriakos caught 31, keeping 6, and Marvin Baer caught 32, keeping 7. On the 1 pm trip Capt. Ken said the fish are flying over the rail 2 at a time. 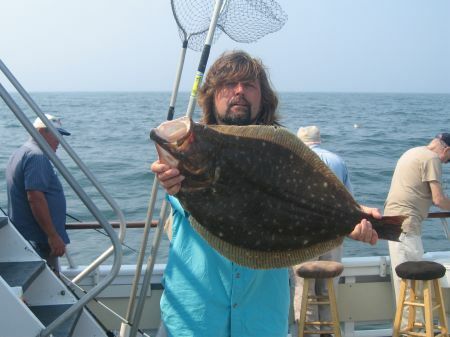 7/31/07 Tuesday @ 8 pm: Today's 1 pm trip pool fish was a 7.41 lb fluke caught by Tom Boccio. Tonight's 6 pm trip is slaughtering the blues in the inlet, with 150 in the boat already. 7/31/07 Tuesday @ 5 pm: On the 1 pm trip Capt. Rich reported they caught over 100 bib fluke. 50 were over 18 inches, and 20 were between 19.5 and 27 inches. the pool fish is around 8 lbs. We will get an official weight at the dock. Sea bass tomorrow! 7/31/07 Tuesday @ 10 am: Last night at 6 pm there were a lot of bluefish around, but they were hard to catch. Today on the 7 am trip Capt Ken found some big fluke. He has 10 fluke between 5 and 8 lbs already. Carmine Spinelli Kept 4 with a total weight of 20.3 lbs. 7/30/07 Monday @ 5 pm: Today's 1 pm trip: 16 fishermen caught 500 sea bass and porgies, keeping 100. Bluefish have returned. They were all over the ocean and inlet today! 7/30/07 Monday @ 11:30 am: No boats sailed at 6:pm last night. The rain scared everyone. The bluefish were in the inlet big time this morning. I hope that they stay for a while. Today's 7 am trip had super sea bass fishing for just 14 people, on a flat calm ocean. 7/29/07 Sunday @ 4:20 pm: Slow fishing on last night's 6 pm trip. Just a few weakfish and a few blues. On the 11 pm trip we caught 6 stripers, 3 weakfish and 20 blues. Today at 7 am they caught 200 fluke, fishing prime time in the bay. Today's 1 pm trip fished in the ocean in heavy rain, with just 14 people, and half of them stayed in the cabin. They still managed to catch 40 fluke, with 1 in 5 between 19.5 and 24 inches. 7/28/07 Saturday @ 2:45 pm: Last night's 6 pm trip was our last evening porgy trip until August 8. We will be sailing 6 pm for stripers, weakfish, and bluefish now thru August 7. They caught Over 200 sea bass and porgies, keeping 60. Last night at 11 pm we caught a few blues, 140 sea bass, keeping 40, and 20 porgies. Today at 7 am they caught 130 fluke for just 13 people. 1 in 10 was between 19.5 and 25 inches. On the 1 pm trip Capt. Ken, with just 19 fishermen, has caught 25 fluke so far, with a few between 19.5 and 24 inches. 7/27/07 Friday @ 4:45 pm Today's 1 pm trip caught 650 sea bass and porgies, keeping 200. 7/27/07 Friday @ 2:30 pm: Last night's 6 pm trip caught 15 weakfish and a few porgies. Tonight's 6 pm trip is likely to go ocean porgy and sea bass fishing. Today's 7 am trip caught 700 sea bass and porgies, keeping over 200. 7/26/07 Thursday @ 4 pm: On last night's 6 pm trip they caught 40 giant porgies [2 to 3 lbs. ],a few blues and a few weakfish. On today's 7 am trip we caught 200 fluke, with half over 17 inches, but not many over 19.5 inches. On the 1 pm trip Capt Ken has caught 100 fluke so far, with 1 in 7 over 19.5 inches. 7/25/07 Wednesday @ 5 pm: Capt. Ken just called. They caught over 1000 fish on the 1 pm trip. They kept 250, half sea bass and half porgies. Mike and Jessie Zyros kept 25 out of 52 caught. 7/25/07 Wednesday @ 2:30 pm: Today's 7 am trip caught 400 sea bass, keeping over 100, and 200 porgies, keeping 100. Dennis Jaigobin kept 8 sea bass and 6 porgies. Brian Martin and family  kept 25 sea bass to 4 lbs., 13 porgies, and a 12 lb striper. 7/24/07 Tuesday @ 10 pm: Tonight's 6 pm trip caught 75 big porgies, 100 sea bass [only kept 5 ] 10 trigger fish, 8 blackfish [out of season], a few blowfish, stripers, and bluefish. Ocean sea bass tomorrow. Tuesday @ 5 pm: Slow fluke fishing after yesterday's storm. 50 fluke in the morning and 75 in the afternoon, mostly small. Porgies tonight, Sea bass tomorrow. Monday @ 11 am: Last night's 6 pm trip caught 10 stripers. A couple were 30 inches. Today's 7 am and 1 pm trips are canceled due to weather. we will make a decision about tonight's 6 pm porgy trip by 4 pm. 7/22/07 Sunday @ 5 pm: On last night's 11 pm trip 26 fishermen caught 35 blues and 10 stripers. Today's 7 am trip caught 140 fluke, 1 in 8 were between 19.5 and 24 inches. 4 year old Kevin Herbst caught the 4.04 lb. pool fish. On today's 1 pm trip the caught 200 fluke. 7/21/07 Saturday @ 9 pm: On today's 1 pm trip Vinny Feola Caught 10 fluke, keeping his limit of 4 to 4.1 lbs. On tonight's 6 pm trip they have 16 stripers, 6 between 28 and 35 inches and 8 blues so far, and they have 2 fish on as I am typing this report. 7/21/07 Saturday @ 3 pm: Last night's 11 pm trip caught 8 stripers, 5 blues, 1 weakfish, and 2 fluke. today they caught 250 fluke 0n the 7 am trip, in spite of almost no drift. On the 1 pm trip they drift better and have 250 fluke already. The nets are really smokin'. 1 in 10 is between 19.5 inches and 25 inches. 7/20/07 Friday @ 10 pm: Today's 1 pm trip kept over 100 sea bass and 20 big porgies. Bill Boffman kept 14 sea bass. Tonight at 6 pm Capt. Ken reports they caught 20 stripers and 15 blues. 7/20/07 Friday @ 2 pm: Last night at 6 pm we just had a few people, so we sent them out on the fine ship "Island Princess". I hope that they did well. Today @ 7 am we sailed with 16 fishermen. Joey DeVito kept 12 sea bass, 3 big porgies, and a 16 lb striper. Matt Fierstein kept 9 sea bass, and 2 jumbo porgies. 7/19/07 Thursday @ 4 pm: We had good sea bass fishing yesterday in the heavy rain. Chris Albrecht caught 30 and kept 11, Lee Hecht caught 15, keeping 8, Pete Phalen had a 4.5 lb. sea bass for the pool. Last night 12 fishermen caught a dozen blues and a keeper striper. Today on the 7 am trip we caught70 fluke, keeping 23 to 8.10 lbs. for 19 fishermen. The 1 pm trip has caught 100 fluke so far, keeping 20. Today's 8.10 lb. fluke is the new leader in our " Free Fishing for Life" contest. It was caught by regular, Jimmy Galliger. Sea bass tomorrow. Remember, Evening porgies start July 23. 7/17/07 Tuesday @ 7 pm: Today's 7 am trip started in the ocean and finished in the bay when the wind dropped out and the drift got too slow. 300 fluke were caught, half over 17 inches and 20 over 19.5 inches. The 1 pm caught 150 fluke for 22 fishermen. Not a lot of keepers. Sea bass tomorrow. 7/16/07 Monday @ 9 pm: Today's 1 pm trip had 300 sea bass and porgies, keeping 150. Tom and Janet Citek Kept 17 sea bass and 11 porgies. Slow fishing so far on the 6 pm trip. Our new 6 pm schedule for porgies will be on the calendar tomorrow. Ocean tomorrow am and prime time bay fluke tomorrow pm. 7/16/07 Monday @ 12 noon: Sunday night's 6 pm trip was slow with a few blues and a few 4 lb. weakfish. We will start 6 pm porgies on prime time only. The first set of trips will be July 23 thru 27. Today's 7 am sea bass trip had good fishing, with 400 fish caught and 150 kept. Bruce Dunston caught 35, keeping 10 sea bass and 5 big porgies. The schedule changes will be completed by 6 pm today. 7/15/07 Sunday @ 12 Noon: Last night's trips were slow with about 15 fish on each trip. Yesterday afternoon fishing the ocean the caught 100 fluke keeping 21 over 19.5 inches. Cathy won the pool with a fluke over 7 lbs. On today's 7 am trip Capt. Rich said the nets were smokin'. They caught 300 fluke, with half over 18 inches and 40 keepers over 19.5 inches. My advice is for the next week or two try to fish the last 2 hours of the flood tide [high tide]. 7/14/07 Saturday @ 2 pm: Last night's 11 pm trip caught 30 blues 10 stripers and 1 weakfish. Today's 7 am trip caught 300 fluke, 100 over 18 inches, and 27 over 19.5 inches. Dave Cicitta kept 4 to 4.00 lbs out of 12 he caught. 7/13/07 Friday @ 10 pm: Today's 1 pm trip had strong current against the wind. They kept 80 sea bass out of 250. Tonight at 6 pm they had 8 big blues in the inlet for about 14 people. 7/13/07 Friday @ 3 pm: Last night's 6 pm trip was slow, just a few fish. Today's 7 am sea bass trip saw a big improvement in the fishing. 500 sea bass were caught and 130 were kept along with 60 big porgies. Because of the improved sea bass fishing we will sail for sea bass every Monday, Wednesday, and Friday, and for fluke every Tuesday, Thursday, Saturday, and Sunday. Here is a tip on the fluke fishing: The last of the flood tide is the best for fluke in the bay. This weekend that is mid morning. You can always check the tide by clicking on the tide table tab to the left. The best ocean fluke fishing is when you can drift at about 1 knot. This usually happens when the wind is about 12 knots. If you have wind against the current in the ocean go play golf. 7/12/07 Thursday @ 5 pm: slow fluking in the ocean today. Jimmy Galliger had the pool fish on the 7 am trip with a 6.53 lb. fluke. There were about 40 fluke and 12 sea bass caught for 14 fishermen. The afternoon had less. Sea bass tomorrow. Sea bass trips are now Friday only. 7/11/07 Wednesday @ 10 pm: Tonight's 6 pm trip had a dozen blues to 10 lbs., a couple of big weakfish to 13 lbs. caught by Rossi Rosario, a couple of stripers and a couple of fluke. 7/11/07 Wednesday @ 6 pm: Yesterday's fluke trips caught caught 50 fluke each, but they were big fish The 7 am trip had a 10.8 pounder caught by Capt. Ken and both trips had a half dozen fish between 4 and 7 lbs. Monday nights 6 pm trip had 25 fish. Today's sea bass trips produced about 150 fish each keeping about 50. We are now sea bass fishing on Friday's only. 7/9/07 Monday @ 4:30 pm: The 1 pm trip had dirty water on the reef from the prolonged south wind. they caught 100 sea bass and kept 40. Look for a change in the wind direction. Wednesday we may start in the bay for prime time porgies. Fluke tomorrow. 7/9/07 Monday @ 11:30 am: Slow fishing on last night's 6 pm trip, 4 stripers and 6 blues for 21 fishermen. Today at 7 am Capt. Ken caught 250 sea bass keeping 100. 95 year old Ziggy Nogiwich kept 7. 7/8/07 Sunday @ 5 pm: super fluke fishing on the 1 pm trip. Close to 200 fluke caught, half over 18 inches, 30 between 19.5 inches and 25 inches. 7/8/07 Sunday @ 2 pm: Saturday's 1 pm trip caught 250 sea bass, keeping 100. Night fishing was slow. The 6 pm trip had 8 blues and the 11 pm trip had 25 blues and a few stripers. Today's 7 am trip caught 120 fluke, and 30 cape shark. 7/7/07 Saturday @ 2:30 pm: Friday afternoon Capt. Ken caught 100 fluke, 20 were over 19.5 inches. Friday's 6 pm trip had 150 bluefish in the inlet. The 11 pm trip with 12 fishermen caught 20 blues and 4 stripers. Today's 7 am trip caught 500 sea bass, keeping 120 plus some porgies, and cape shark. Anthony Prisco took the pool with a sea bass of 6.59 lbs. 7/6/07 Friday @ 2 pm: Last night's 6 pm trip did not sail [weather]. Today @ 7 am we changed today's trips to fluke due to a big swell in the ocean. We caught 120 fluke, 40 over 18 inches, not many over 19.5 Sea bass tomorrow. 7/5/07 Thursday @ 5 pm: On today's 1 pm trip they had prime time. they caught 200 fluke, 80 were over 17 inches, 12 were between 19.5 inches and 25 inches. Tomorrow's sea bass trips have been changed to fluke due to rough seas [and good fluke fishing]. 7/5/07 Thursday @ 3 pm: On yesterday's 1 pm trip Ed Kahune was hi hook keeping 19 sea bass and 5 porgies. On today's 7 am trip 10 fishermen caught 130 fluke. 50 were over 17 inches and 14 were over 19.5 inches. Tomorrow's 7 am and 1 pm trips will be changed to fluke due to rough seas. 7/4/07 Wednesday @ 2:30 pm: Last night's trips were slow. The 6 pm trip had 15 blues and the 11 pm trip had 3 stripers to 29 inches and a dozen blues. Today's 7 am trip caught 400 sea bass, keeping 120, plus 40 big porgies and 10 ling. Capt. Ken Just anchored up and they have caught 20 big sea bass already on the 1 pm trip. 7/3/07 Tuesday @ 3:30 pm: On today's 7 am trip Capt. Ken fished the ocean in 60 feet of water, with no wind and little drift they caught 90 fluke, keeping 21 over 19.5 inches. On the 1 pm trip Capt. Rich Has caught 50 fluke so far keeping 10, fishing the the same 60 foot depths. 7/2/07 Monday @ 11 pm: Capt. Rich on the 6 pm trip caught 70 blues fishing from the inlet to the lighthouse. 7/2/07 Monday @ 4:30 pm: On today's 1 pm trip Capt. Ken caught 250 sea bass, keeping 100, plus 20 big porgies, a couple of big fluke, and a 28 lb striper. Adam was hi hook, keeping 10 sea bass. 7/2/07 Monday @ 11:45 am: Last night's 6 pm trip had slow fishing, from the inlet to Point'O Woods, catching a couple of stripers and a dozen blues. Today's 7 am trip caught 400 sea bass, keeping 200, plus a fluke close to 7 lbs. 7/1/07 Sunday @ 3 pm: today's 7 am trip caught about 80 fluke, with half over 18 inches. The 1 pm trip is fishing the ocean and they have caught 30 fluke so far, with 5 over 4 lbs, plus some sea bass. 7/1/07 Sunday @ 10 am: Last night's 11 pm trip had slow fishing with 6 blues, 7 sea bass, 1 striper, 25 dogfish. 6/30/07 Saturday @ 10 pm; Today's 1 pm trip wound up catching 300 sea bass, keeping 150. Tonight's 6 pm trip caught 50 blues and a couple of big weakfish. 6/30/07 Saturday @ 2:40 pm: Last night's 11 pm trip caught 8 stripers and 4 blues. Today's 7 am trip caught 600 sea bass, keeping 200 plus 60 big porgies. Capt. ken has kept 60 out of 150 sea bass already on the 1 pm trip. 6/29/07 Friday @ 10 pm: Tonight's 6 pm trip had 40 blues and one big weakfish. Today's 1 pm trip wound up keeping 250 fish for 28 people. 6/29/07 Friday @ 4 pm: Last night's 6 pm trip didn't sail, severe thunderstorms. Today's 7 am trip caught 300 sea bass, keeping 100. Paul Curdo kept 10. The 1 pm trip with Capt. Ken has kept 100 sea bass and 100 porgies so far. Paul Curdo has 12 sea bass and 10 porgies in his bucket on the 1 pm trip. 6/28/07 Thursday @ 4 pm: The 1 pm trip sailed with just 8 fishermen. So far they have caught 80 fluke 5 lbs. 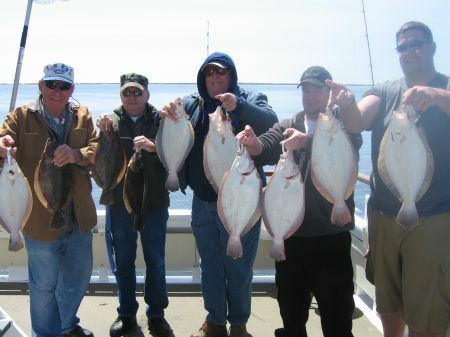 6/28/07 Thursday @ 2 pm: On today's 7 am trip 17 anglers caught about 100 fluke and 8 blues. Half the fluke were over 18 inches, 24 were over 19.5 inches. Jimmy Mckenna was hi hook, keeping his limit of 4 up to 4.1 lbs out of 16 caught. 6/27/07 Wednesday @ 9:30 pm: On tonight's 6 pm trip they have 40 blues and a couple of big weakfish, so far. 6/27/07 Wednesday @ 6 pm: Today's 1 pm trip caught 400 sea bass, keeping 120. 20 fish were big 3 to 4 lb. 6/27/07 Wednesday @ 2 pm: today's 7 am trip caught 500 sea bass, keeping 140 plus 40 big porgies. 6/26/07 Tuesday @ 10:30 pm: Tonight's 6 pm trip caught 8 stripers and 25 blues. 6/26/07 Tuesday @ 4:30 pm: Today's 1 pm trip caught 130 fluke with half between 17 and 22 inches. 6/26/07 Tuesday @ 11:30 am: Today's 7 am fluke trip started in the bay on prime time then went into the ocean in 60 foot depths. 28 fishermen caught 250 fluke, 125 over 16 inches, 25 over 19.5 inches. 6/25/07 Monday @ 9 pm: I just spoke to Capt. Rich. On tonight's 6 pm trip they have 18 fishermen and they have caught 30 blues, 12 stripers, and a 6 lb. fluke so far. 6/25/07 Monday @ 4:30 pm: Sea bass fishing was about the same on both trips today, catching 400 sea bass and keeping 100 a trip. Paul Cerdo was hi hook on the 7 am trip keeping 13 sea bass. 6/25/07 Monday @ 8 am: Last night's 6 pm trip caught 30 blues, 2 big weakfish, and 2 stripers. 6/24/07 Sunday @ 4 pm: I just spoke to Capt. Rich on the 1 pm trip. They have caught over 100 fluke already. Fish up to 4 lbs. fishing in the ocean in 50 feet of water. Sea bass tomorrow! 6/24/07 Sunday @ 11:30 am: Last night's 6 pm trip had slow fishing with 6 stripers and 6 blues. The 11 pm trip had 70 blues and 14 stripers. Today's 7 am trip had great fluke fishing. Capt. Rich reported the the fluke showed up big time in the ocean with over 200 caught with 100 fish between 17 and 24 inches. The pool fish looked to be over 5 lbs. 6/23/07 Saturday @ 5 pm: Today's 1 pm trip caught 500 fish, keeping 200, mostly sea bass. David palmer kept 9 sea bass and 7 porgies. The picture is of a lucky blackfish. He is out of season and about to go back to his home in the wreck below. 6/23/07 Saturday @ 1:30 pm: Had a big crowd on the 7 am trip. Caught 500 mixed sea bass and porgies and kept 200. Sailed @ 1 pm with about 20 fishermen. The catch should divide up a little better this afternoon. 6/23/07 Saturday @ 9 am: Last night's 6 pm trip caught 45 blues. The 11 pm trip had 50 blues and 9 stripers to 31 inches. 6/22/07 Friday @ 4:30 pm: On today's 1 pm trip Capt. Ken said they kept 200 fish, mostly sea bass, out of 600 caught. 6/22/07 Friday @ 3 pm: On today's 7 am trip sea bass fishing was good until 10 am when the wind started blowing nw at 30 knots. We wound up keeping 175 sea bass and some big porgies out of 500 caught. 6/21/07 Thursday @ 9 pm: Today at 7 am we caught 150 fluke to 6.6 lbs. The 1 pm trip had 125 fluke to 4.3 lbs. Tonight's 6 pm trip had slow fishing with just a couple of keeper stripers until 8 pm then the blues started to bite with 50 in the boat already. 6/20/07 Wednesday @ 7 pm: Super bluefishing tonight. The 6 pm trip has over 100 blues already. It seems the bluefishing is great every other night. 6/20/07 Wednesday @ 3 pm: Super sea bass fishing today. On the 7 am trip 95 year old Ziggy Nogowich kept 15 big sea bass and Bruce Tomaselli kept 18. On the 1 pm trip Capt Ken just called and they have kept 300 fish already. Last night's 6 pm trip had 20 blues and a couple of stripers. 6/1907 Tuesday @ 5 pm: Today's 1 pm trip totaled 150 fluke keeping 44 over 19.5 inches. Sea bass tomorrow. 6/19/07 Tuesday @ 2 pm: Today's 7 am trip caught over 100 fluke. On the 1 pm trip Capt. Ken has prime time [ last of flood and first of ebb ]. I just got off the phone with him and he has 50 fluke already with 1 in 3 over 19.5 inches. 6/18/07 Monday @ 8:20 pm: Good bluefishing on tonight's 6 pm trip, plus a couple of stripers. I am on the phone with Capt. Rich and typing with one hand. They have 70 fish in the boat and 4 on as we speak. Capt. Ken did catch 150 Keeper sea bass and porgies on his last drop this afternoon. 6/18/07 Monday @ 4 pm: I just spoke to Capt. Ken on the 1 pm trip. Hi hook has 12 sea bass. He said he is saving the best drop for last. 6/18/07 @ 11 am: Last night's 6 pm trip had 45 blues and one striper. On today's 7 am trip Capt. Ken said that they have kept 200 sea bass and 50 big porgies out of 800 fish caught so far. 6/17/07 @ 5 pm: Slow fishing on today's 1 pm fluke trip. Some Fluke everywhere , but fish over 19.5 inches were hard to find. Ebb tide and boat traffic is a bad combination! Caught about 80 fluke total. 6/ 17/ 07 @ 12 noon: hi hook on today's 7 am trip John Taylor with 7 fluke to 4.7 lbs. Caught about 125 fluke total. 6/17/07 Sunday @ 9 am: Slow fishing on last night's 11 pm trip. A 13 lb striper took the pool, and we had about a dozen blues. 6/16/07 Saturday @ 9 pm: Caught 50 blues on tonight's 6 pm trip so far. Today's 1 pm trip kept 300 sea bass and 100 big porgies. Pete burns kept 10 sea bass and 5 porgies, and threw back another 15 sea bass. 6/16/07 Saturday @ 3 pm: On today's 7 am trip we caught 800 sea bass and kept 300 plus 50 big porgies. Last night's 6 pm trip was slow with a couple of stripers and a few bluefish. The 11 pm trip had 30 stripers and a dozen blues. Jose Santelices caught 6 stripers and a 14 lb. blue. Jose Ornellas [ hose b ] Kept stripers of 12 and 13 lbs. 6/15/07 Friday @ 5 pm Kept 170 sea bass and 30 big porgies out of 600 fish on the 1 pm trip. 6/15/07 Friday @ 2 pm: Good sea bass fishing on today's 7 am trip, with 700 caught and 250 kept plus 40 big porgies and a big striper. Vincent Lorusso had the pool with a 5.1 lb. sea bass and he kept another 11. 6/14/07 Thursday @ 10 pm: Super striper fishing on tonight's 6 pm trip. with just 12 passengers Capt. Ken had 40 stripers., keeping 20 to 24 lbs. Most of fish were caught in the inlet. 6/14/07 Thursday @ 4:20 pm: Today's 7 am trip had 80 fluke, half over 17 inches, and 20 over 19.5 inches. the 1 pm trip has 100 fluke already with 17 between 19.5 and 24 inches. Last night on the 6 pm trip just 5 fishermen kept 2 stripers out of 3 and a half dozen blues. On yesterday's 1 pm trip Tony Lepore kept 23 sea bass, Nick Petino 20 and Hal Cassanzo 20. Sea Bass tomorrow. 6/13/07 Wednesday @ 2:15 pm: Good sea bass fishing on today's 7 am trip. We caught over 1000 fish, keeping 300 sea bass and 50 porgies, a big striper and a few ling. Jimmy Morin was hi hook keeping 17 sea bass and 6 big porgies. I just spoke to Capt. Ken and he is catching double headers of big sea bass on his first drop. 6/12/07 Tuesday @ 11 pm: Tonight's 6 pm trip had super fishing for bluefish averaging 10 fish a man. they also had an 11 lb. weakfish. 6/12/07 Tuesday @ 5 pm: On today's 7 am trip 15 fishermen caught 80 fluke. Jim Mackena was hi hook with 16, keeping 4 to 3.92 lbs. The 1 pm trip had 40 fluke fishing in the ocean. 8 were between 20 and 24 inches. Sea bass tomorrow. 6/11/07 Monday @ 7:30 pm: The sea bass bight was off today. Regular Ed Was hi hook in the morning with 14 that he kept. The 1 pm trip saw some big sea bass. 10 were between 3 and 5 lbs. A big fluke of 7.53 lbs. was caught by Lynn Dilucchio on a clam to take the lead in our " Free Fishing For Life Contest ". Last night's 6 pm trip was slow with just a handful of blues and a 25.5 inch striper. I just called Capt. Rich on tonight's 6 pm trip and they have caught 5 stripers and a few blues so far. 6/10/07 Sunday @ 5 pm: Last night's 11 pm trip saw a dozen blues and 6 stripers. Tom Mazur out fished everyone, keeping stripers of 20 and 23 lbs. and 3 blues. Today on the 7 am trip Capt. Rich caught 100 fluke fishing prime time in the bay and finishing in the ocean. 1 fluke in 5 was over 19.5 inches. On today's 1pm fluke trip they fished around wrecks catching 35 with 6 weighing over 4lbs. plus 30 big sea bass. 6/9/07 Saturday @ 9 pm: I just spoke to Capt. Ken on the 6 pm trip. They caught 15 blues and 8 stripers so far. The 1 pm trip wound up with 350 keeper sea bass and 50 big porgies. Jenny Dawson, 16 years old led the way keeping 20. 6/9/07 Saturday @ 2:30 pm: Super sea bass fishing again today, 400 keeper sea bass on the 7 am trip, hi hook was Sheila with 19. last night's trips were slow with just a few blues and a couple of stripers and weakfish. This easterly breeze could change that quickly. The fluke boats had pretty good fluke fishing today in the ocean. I just spoke to Capt. Ken , they have 100 big sea bass already and some giant porgies, one porgy measured 21 inches. 6/8/07 Friday @ 3:45 pm: I just spoke to Capt. Ken on the 1 pm trip and they already have over 300 sea bass in the boat, hi hook has 21 and a lot of the fish are 3 to 6 lbs. 6/8/07 Friday @ 2 pm: Last nights 6 pm trip had 40 blues for 16 passengers. Today's 7 am trip, we kept 296 sea bass. Frank Napoliteno Kept 19 and Rich Guttler Kept 20. 6/7/07 Thursday @ 5 pm: Today's 7 am trip caught 60 fluke for 9 fishermen. Most fish were between 16 and 22 inches. I just spoke to Capt. Ken and the 1 pm trip sounds about the same. Joe Zito kept his limit of fluke 19.5 inches to 23 inches! 6/6/07 Wednesday @ 10 pm: Today's 1 pm trip saw the ocean swell diminish to 3 feet and the sea bass bight a little faster. Steve Edison was high hook with 12 keeper sea bass. Tonight at 6 pm it was a total slaughter on the bluefish with many people catching their limit of 15. 6/6/07 Wednesday @ 3pm: Last night 7 fishermen on the 6 pm trip caught 50 blues and 1 striper. Today's 7 am trip saw a 5 foot left over ground swell in the ocean. This caused the sea bass to bite slowly. Andy Davis was high hook keeping 12 sea bass. Gary Epstein Had the pool with a 6.2 lb. sea bass. 6/5/07 Tuesday @ 8 pm: Capt. Rich is catching the bluefish tonight. With just 7 fishermen they have boated 25 blues already. After dark he will try for stripers. Sea bass tomorrow. 6/5/07 Tuesday @ 4 pm: Today at 7 am 13 people caught 70 fluke. Half the fish were between 17 and 22 inches. Jim Morin kept his limit of 4 to 3.5 lbs. I just spoke to Capt. Ken on the 1 pm trip, with 16 fishermen they have caught 40 fluke so far, 12 over 19.5 inches. Last night's 6 pm trip was slow, probably due to the storm, with just a few blues and a couple of stripers to 13 lbs. Sea bass tomorrow. 6/4/07 Monday @ 9 am: Today's 1 pm trip is canceled due to weather. The 6 pm trip will sail as scheduled. 6/3/07 Sunday @ 2:15 pm: Monday's 7 am trip is canceled because of weather. The 1 pm trip has been changed to fluke due to forecasted seas 6 to 10 feet. All other trips will sail as scheduled. 6/3/07 Sunday @ 2 pm: Last night's 11 pm trip had 3 keeper stripers to 17 lbs. 3 shorts and 15 blues. This morning at 7 am the boat caught close to 100 fluke, keeping 21 over 19.5 inches. Domald H. Kim caught a 6.24 lb. fluke to become the new leader in our free fishing for life contest. 6/2/07 Saturday @ 9:30 pm: Good sea bass fishing on today's 1 pm trip. Paul Stevens Kept 21 and Eddie Kahune 17. The 6 pm trip had 200 blues and a couple of keeper stripers. Fluke tomorrow. 6/2/07 Saturday @ 2:30 pm: On Friday's 1 pm trip J.J. was hi hook with 16 sea bass and 7 porgies. Friday at 6 pm 50 blues were caught. 11 pm trip had 35 blues and 30 stripers. Chris Bell had keepers of 12 and 20 lbs. Jose Santelices had 5 stripers to 12 lbs. Fernando Gray had the pool with a 25 lb. striper. This morning at 7 am Luis and Taryn Pena kept 15 sea bass and 2 porgies. I just talked to Capt. Ken on the 1 pm trip and they already have a fisherman with 12 big sea bass. 6/1/07 Friday @ 3 pm: Sea bass and porgies today, strong current to the west and dirty water to start made for a slow bite to start. Fishing improved as the morning went on. Joe Giordano was high hook keeping 8 sea bass and 7 porgies. Capt. Ken just called and they caught 150 sea bass and porgies on the first drop, on the 1 pm trip. The 6 pm trip was picky last night. I think they caught about 40 blues and one big striper. 5/31/07 Thursday @ 6:30 PM: 7 am trip today saw improved fluking in the bay on prime time [last of the flood and the first of the ebb]. 17 fishermen caught 50 fluke, keeping 19 to 5.09 lbs. for Eddie Drago. plus a dozen blues. The afternoon trip was slow on the end of the ebb tide, but 20 blues added to the action. 5/30/07 Wednesday 8 pm: Excellent bluefishing on the 6 pm trip tonight. The 1 pm trip had good sea bass fishing, but we had trouble catching them on the starboard side. Next sea bass trip Friday and we can keep 25 porgies a man. 5/30/07 Wednesday @ 12 noon: The 7 am trip today kept about 200 sea bass and threw back a mess plus a lot of big porgies, that we can keep starting Friday. Joe Stevenson fishing in the bow was high hook with 14 keeper sea bass. 5/29/07 Tuesday @ 7:15 pm: Slow fluke fishing today, probably something to do with Thursday's full moon. Last night's 6 pm trip had 55 bluefish, tonight it is a total slaughter with many people limited out already. Sea bass tomorrow. 5/28/07 Monday @ 2:30 pm: Today on the 7 am trip over 1000 sea bass and porgies were caught, with all the porgies and half the sea bass put back. 350 sea bass were kept. Capt. Ken just called to say that they have 150 sea bass in the boat on the 1 pm. trip in the first half hour of fishing. Porgy season opens Friday. I almost forgot, Sunday's 11 pm trip had 45 bluefish and 5 stripers for 22 fishermen. 5/27/07 Sunday @ 8:30 pm: Today at 1 pm fished the ocean for fluke. Capt. Rich picked at the fluke with a handful of keepers. the biggest fluke, 6 or 7 lbs. hit the nonskid deck went threw the scupper and back in the water. Sometime the fish win. Tonight's 6 pm trip he is slaughtering the blues again with over 200 already. 5/27/07 Sunday @ 3:00 pm: Saturday's 6 pm produced over 200 bluefish. The 11 pm trip had 60 blues and 5 stripers to 31 inches. Saturday's 1 pm trip saw slow fluking in the ocean, so Capt. Ken gave them an hour of super sea bass fishing at the end of the trip, with over 200 giant sea bass. Our new schedule: sea bass Monday, Wednesday, Friday, and Saturday. Today's 7 am fluke trip caught over 100 to 4.6 lbs. 5/26/07 Saturday @ 1:30 pm: Friday night 6 pm trip saw about 175 bluefish. High hook caught 21. The 11 pm trip saw 60 blues and 7 stripers. Today's 7 am fluke trip had 150 fluke to 4.41 lbs. 5/25/07 Friday @ 4:40 pm: today's 7 am trip we kept 400 sea bass, threw back 800 and 100 out of season porgies. I just spoke to Capt. Ken. On the 1 pm trip Clarance Butler was high hook with 20 keeper sea bass. Porgy season opens next Friday 6/1/07. Starting 6/2/07 we will start sea bass fishing on Saturday too. 5/24/07 Thursday @ 8 pm: Tonight's 6pm trip has 250 bluefish already, many people are already limited or worn out. Fluke fishing was ok today. The 7am trip saw about 60 fluke to 4.4 lbs. Capt. Ken said the afternoon trip was about the same. Sea bass tomorrow! 5/23/07 Wednesday @ 7:15 pm: Last night's 6pm bluefish trip was slow with about 40 blues and a couple of stripers, but tonight they are slaughtering them at the coast guard station! Good sea bass fishing today with about 400 kept in the morning and 300 in the afternoon. Fred, John, and Annette Mysliwiec kept 35 in the morning and 30 in the afternoon. 5/22/07 Tuesday @ 5:45 pm: Ok fluke fishing today. Most fish 14 to 18 inches. Loads of bluefish mixed in with the fluke. Sea bass tomorrow! 5/21/07 Monday at 7:30 pm: Both sea bass trips today had great fishing. We kept about 1400 sea bass for the day. Many fishermen kept over 20. I just spoke to Capt. Rich and they are slaughtering the blues again in the inlet on the 6 pm trip. 5/21/07 Monday 8:20 am: Sunday night 6 pm trip super fishing in the inlet. many Regulations of blue fish. largest striper 25 inches. I just spoke to the boat and they already have over 100 sea bass in the boat this morning. 5/20/07 Sunday: posted at 12 noon: Saturday 6pm trip slaughtered the blues in the inlet James Goldade was hi hook catching 36. almost every one kept their limit of 15. the 11 pm trip saw a mix of stripers and blues. Brian Dunston out fished everyone catching 8 stripers to 13 lbs. This morning fluke fishing was good for the first couple of hours until the current ran full force. Tomorrow sea bass. 5/19/07 Saturday at 2:05 pm: we sailed at 7 am with 21 fishermen, caught 140 fluke up to 4.31 lbs and about 60 bluefish, John, Dave, Jim, and Moses [Jersey Boys] caught 41 fluke and 21 blues. the boat sailed at 1 pm and they have caught 40 fluke already. 5/18/07 Friday: coastal storm today we didn't sail any trips. 5/17/07 Thursday 9:05 pm: 7am trip just 6 fishermen caught 30 fluke, 6 between 19.5 inches and 23 inches. 1 pm we sent our 5 fishermen over to the JIB VI. 6pm catching lots of blues, about to go and try for stripers the last hour. 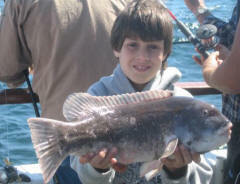 5/16/07 Wednesday: 7 to 8 foot seas in the ocean today so we changed the sea bass trips to fluke and blues in the bay. caught about 70 blues and 30 fluke keeping about a half dozen on each trip. pool fish 4.8 lbs in the morning and 4.92 in the afternoon, the dock pool winner. the 6pm trip did not sail due to severe weather. 5/15/07 Tuesday night at 9:40 pm the boat just called. they limited out on bluefish and now they are catching big stripers. 5/15/07 Tuesday, last night 6pm trip had super fishing for big blues and a few stripers. today 7 am 18 fishermen caught about 100 fluke keeping 10 over 19.5 inches. the 1 pm trip had 4 keepers on the first drift at 2:15 pm. 5/14/07 Monday 7am trip today super sea bass fishing and lots of out of season big porgies mixed in. about 500 fish caught. 2 full lugs of racks. at 2:30 pm they already had over 100 big sea bass on the afternoon trip. last night 6 pm trip: 9 fishermen 18 big blues in the inlet and 2 stripers. today Saturday 7am about 150 fluke caught 1 in 7 a keeper 19.5 inch. about half the fish caught are over 17 inches. everyone catches fish. last night fishing was slow until 2:30 am, from then until 3:30 am we caught about 80 blues between 4 and 6 lbs. under schools of bunker. Today's sea bass fishing on the Laura Lee was nothing short of phenomenal with over five hundred keepers landed on the two trips .Both trips saw a few blacks up to eight pounds mixed in and many sea bass were between two and four pounds with five pound fish winning the pool on both trips. Many Regulations were caught with Tim Duncan limiting out on the one pm trip We sea bass both trips on Mondays, Wednesdays, and Fridays and fluke the other days. Friday, 7am and 1pm trips now Monday Wednesday Friday sea bass. super fishing today, both trips. many people kept over 20 big sea bass. also blackfish to 10 lbs. on the 7am and big bluefish mixed in on the 1pm. Thursday: 7am trip good fluke today, 12 fishermen over 100 fluke caught about 1 in 5 over 19.5 inches, half over 17 inches. jimmy Gallager kept 2 out of 10, Ron Astheimer kept 3 out of 12, john kept 3 out of 6, Robbie Ames kept 2 out of 15. Robbie also won yesterdays dock pool. that makes 5 straight dock pools for the boat. 1pm fluke was slow until the last hour. the middle of the flood tide has been the only slow fishing. last night's 6 pm trip saw 40 big blues. tomorrow both trips for sea bass. Wednesday 7am fluke excellent over 200 fluke caught about one third between 17 and 22 inches. Lim Yang-Hyuk high hook with 23 fluke, 5 that were over 19.5 inches, largest 5.02lbs. unfortunately he wasn't in the dock pool. Chuck Ertle is our dock pool leader at 4.64 lbs. his largest of 20 caught. fluke fishing not as good today 7am and 1pm trips averaged about 5 fluke per person with about 1 keeper out of every 5. 6 pm trip super again with big blues from the bridge to the inlet. Today the fluke trips on the Laura Lee saw about two hundred shorts and eighteen keepers for twelve fares on the seven am trip with the pool fish over five pounds. The past three days we have had pool fish over five pounds. Last night they slaughtered the blues with a few bass mixed in, on our photos page a few photos of today's fluke. 7 am and 1pm fluke not many fishermen on either trip today good fishing both trips. i think about 20 kept in the morning and a few less this afternoon. tonight 6pm trip slaughtering big blues as this report is being posted. Sunday 7am fluke Howard sunshine had the pool fish 5.88 lbs. Joe Lambert kept 4 to 4.9 lbs. total 29 keepers out of 90 caught. last night 11pm. trip 22 fishermen 4 keeper stripers to 16 lbs. 11 short stripers, 7 bluefish. Jose Santelices hah a keeper tonight and 2 Friday night at 11 pm. if you want to catch stripers watch how he fishes. Saturday 1pm fluke saw about 30 keepers out of about 100. Saturday 6 pm trip caught about 35 bluefish. last night Friday, 6 pm trip super fishing, most people had their limit of bluefish. 17 lb striper took the pool. over 300 fish caught. 11 pm trip caught 75 bluefish, 5 keeper stripers and 5 short stripers. today Saturday, 7 am 83 fluke caught 29 keepers. pool 5.39 lbs. Jim O'connell. 7am trip today Friday 171 fluke caught , most between 17 and 22 inches. high hook Todd 17 fish. yesterday's afternoon sea bass trip caught over 100 on the last stop. super fishing last night, Thursday, 6pm. 5 keeper stripers, 10 short stripers, 150 big bluefish, and the first weakfish. fish were chasing squid that came in on the flood tide. Sailed last night at 6pm with 6 fisherman, caught 3 keeper stripers, and many bluefish bite offs. 7am today Thursday 13 fisherman caught 2 keeper stripers, 2 short stripers, 2 4lb bluefish. when the tide eased we switched to fluke caught 6 keepers to 4.5 lbs. and about 30 between 14 and 19.5 inches. this afternoon's 1pm trip went to the reef as of 2:55pm they kept about 20 big sea bass and a few keeper blackfish.
. on the 1pm trip ken went sea bass fishing and caught about 100 keepers. we will probably fish for sea bass on the 1pm trip this wed. Thurs. and Friday. sailed today Monday @ 7 am this report is being posted @ 8:20 am the boat is almost limited out on stripers already. they came in with the bait on the flood tide and hopefully will stay a long time. Laura Lee will be starting the season on Saturday, April 21st fishing for Striped Bass. See our calendar for full sailing schedule.